Alisa Murray, Timothy Condon, and Dylan Lamb in Ten Ways on a Gun. Photo by Joshua Sterns Photography. BOTTOM LINE: A gun-toting-farce about finding closure in a cold and lonely world, delivered with fierce, self-aware glee. 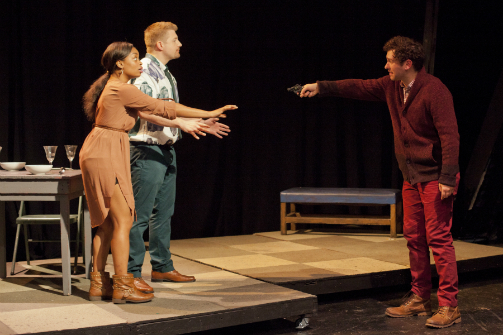 The feat and the accomplishment of Squeaky Bicycle’s world premiere of Dylan Lamb's surreal comedy Ten Ways On A Gun are both brave and manic. Their impressive Monday night performance was followed by a standing ovation and some hearty hollering. Replete with moments of deep drama and biting humor, magic realism and absurdly endearing dance numbers, the show works as a commentary on both the versatility and power of theatrical storytelling: here that power and versatility is turned on American obsession with guns. The production fully acknowledges the blissfully meta approach of telling a fictional story about a fictional story about an all too real yet obviously fictional man and his gun. At rise we’re met with Stage Directions—played tongue-in-cheek with stalwart dedication by Laura Darrel—an all too real performer truly pissed off to be playing stage directions instead of an actual human. Yet, she soldiers on, narrating the entire night, revealing foremost that we are witnesses to Soul Motion Architect’s (SMA), an over-ambitious and hilariously misdirected fledgling theatre collective’s, latest theatre-dance opus on American gun violence. Their subject is Thomas Freely, a mild-mannered telesales rep from Bushwick with a pretty trippy tale. In an effort to get a grip on his lackluster life, Freely (played by the actual playwright Dylan Lamb, a Zach Braff type, but with balls) buys a gun on Ebay from a housewife in (where else?) Texas. Much to his chagrin his vegetarian girlfriend does not find the impulse-buy charming. They live together and her word is law, so Tommy has to sell the gun to a douchey coworker Philly (Timothy Condon, who is in truth rather charming in the role). Philly has a vision and a sense that the gun is mystical, full of restorative powers, and starts renting the gun out. Some lease it for a day, others for a week; some maybe just to hold it, others to play pretend ‘what if’ they had to use it, and others still just to enjoy the feeling of the security of owning a gun. Ten Ways On A Gun turns morbid satire while earning its title, as eventually ten satisfied clients simultaneously time-share Freely’s gun. All the while the SMA are hard at work, building a theater piece in response to Freely’s escapades. Unlike its no-doubt inspiration, Pirandello’s classic absurd comedy Six Characters In Search of an Author, Lamb’s Ten Ways on a Gun is never boring. It is a hyper-active darkly comic trip, questioning why choose theater as a platform to speak out on gun violence? What is the purpose of art when real folks are really shooting the heck out of each other, sometimes even inside the comforts of our theaters? “I spent so much time making you up, I forgot that I don’t know anything about you,” complains SMA’s leader Jessica Person (the vulnerable and sharp Brandi Varnell) in a penultimate showdown with Tommy Freely. The script both admonishes and celebrates artists who are inspired by our American obsession with gun-violence only to create work which in turn seems to perpetuate rather than end the cycle of our American obsession with gun-violence. From the very outset this show plays with the convention of theater and kudos to director Kathryn McConnell for controlling the manic action with transparent simplicity and fierce energy. For the deluded, depressed denizens of this surreal comedy of errors, a gun is a symbol of rebirth and power. Following a burly yet sensual gun-wielding dance number set to "If You Like Piña Colada," a scene stealing Nathaniel Kent, as the cocky-but-kind telesales co-worker and bear-lover Kugel, rediscovers the true meaning of the song. “It’s about loss, and finding each other.” Through Kugel and the musical miracle of that song, Lamb touches upon theatre’s powers for self-renewal. Perhaps the gun is ultimately a metaphor for the darker side of art, the one we cross over to again and again in attempts to exercise our collective coping mechanisms. My biggest gripe is that the show is less diverse than it could be, especially for a production that is otherwise so timely and self-aware. I think that Squeaky Bicycle could have done more to reflect its multicultural community in the casting. Over all, Squeaky Bicycle is on to something deep and complex with Lamb’s Ten Ways On A Gun. As Freely’s vegetarian girlfriend puts it “a gun is a gun is a gun,” and guns are no joke, and neither is Dylan Lamb. So, if you happen to feel that people should stop shooting each other with guns, you owe it to yourself to check out this production.